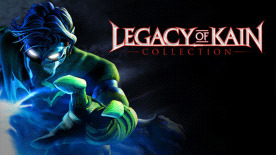 The Legacy of Kain Collection includes four classic Legacy of Kain titles, plus the Veteran Pack for the brand new and bloodthirsty multiplayer outing, Nosgoth. Hundreds of years of conflict and hatred, each race pitted against the other. This is the war for Nosgoth, a war for supremacy and for survival. Join the war between Vampires and Humans using each race’s unique fighting style to conquer and crush the opposition.